9-11 November 2017. 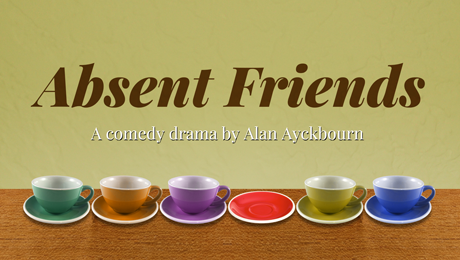 SCURC Dramatic Society is proud to present Alan Ayckbourn’s comedy drama Absent Friends. 5-7 May 2016. SCURC Dramatic Society proudly presented Deadly Nightcap. Red herrings, dodgy dealings and murder abound in this gripping whodunit by Francis Durbridge. 1-3 October 2015. SCURC Dramatic Society presented The Unexpected Guest, a thriller by Agatha Christie. 6-8 February 2014. SCURC Dramatic Society presented The Vicar of Dibley, an amateur performance in support of Comic Relief by kind permission of Richard Curtis, Paul Mayhew-Archer and Tiger Aspect Productions. 8-11 May 2013. In this stage adaptation of the hugely popular TV series by Jimmy Perry and David Croft, SCURC Dramatic Society revisited the 1950s and Maplins Holiday Camp with its host of colourful characters. 10-13 October 2012. SCURC presented The Axedowne Mystery by Michael Marsh. This 1920s plot revolves around the proceeds of a diamond robbery that happened three years previously. 18-20 May 2011. SCURC Dramatic Society was delighted to have permission to perform two episodes of Blackadder in support of Comic Relief. 9-11 June 2010. SCURC Dramatic Society proudly presented two classic TV episodes from the ever popular Dad’s Army, specially adapted for the stage by Jimmy Perry and David Croft.